This story was updated at 10:30 a.m. ET, April 12. The reclusive North Korea is poised to launch a rocket by April 16 on a mission that has provoked scorn from the international community, which sees the flight as a missile test in disguise. North Korean officials have said the country's new Unha-3 rocket will launch an Earth-observing satellite sometime between April 12 and April 16 in honor of the 100th anniversary of the birth of Kim Il Sung, the country's founder. The country skipped the first day of the launch window, however, possibly due to unfavorable weather, according to press reports. But questions remain over the true nature of the launch and the state of North Korea's rocket technology. Below, SPACE.com looks at five big questions, and some answers, facing North Korea's newest rocket launch. North Korean space officials claim the rocket will demonstrate their country's technical achievements and the "might of another space power advancing towards the world standards by pushing back the frontiers of latest science and technology," according to the state-run Korean Central News Agency. North Korea's announcement of the rocket launch in March was seen as a surprisingly provocative move since it came after the impoverished nation agreed with the United States to suspend future missile tests in return for food aid. What is the rocket's mission? The rocket's flight path will carry it southward, with the first stage dropping into the Yellow Sea and third stage falling into ocean waters around the Philippines, according to press reports. 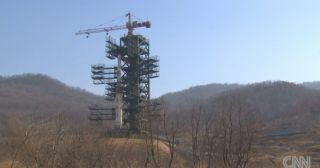 South Korean officials have vowed to shoot down any pieces of the North's rocket that look as if they will fall on South Korean territory. Aside from the many technical hurdles, North Korea's location on Earth makes it a particularly tricky spot from which to launch rockets into space. North Korea is located at the latitude of 39.4 degrees north of the equator. The closer a launch site is to the equator, the easier it is to send payloads into orbit because of the boost gained by the increasing surface speed of Earth's rotation. Being so far from the equator — about 2,700 miles (4,300 km) away, compared with about 1,950 miles (3,100 km) away in the case of NASA's spaceport in Cape Canaveral, Fla. — can make it difficult to reach the more-traveled orbit inclinations used by other nations. Also, the country's relatively close proximity to China, South Korea, Japan and the Philippines makes finding a clear launch range over ocean difficult. A clear range is important to avoid injuries or damage on the ground that could be caused by a rocket failure. With this being the first launch of the Unha-3 rocket design, its success or failure is difficult to predict. But North Korea's two previous attempts to launch a satellite did fail to reach orbit. In April 2009, North Korea again tried to launch a satellite, this one called Kwangmyongsong-2. That launch used an advanced version of the Taepodong-2 rocket; it ultimately crashed into the Pacific Ocean, according to Western observers. The rocket's third stage apparently failed to ignite as planned, according to an analysis at the time. As with the 1998 test, North Korean officials maintained the launch was a success. After North Korea's 2009 launch failure, the results of that mission came from independent analysis. While North Korean officials claimed the launch was a success, outside observers saw no evidence of any satellite reaching orbit. If North Korea's new Unha-3 rocket succeeds to place a satellite into orbit, an official announcement would be expected. In an unprecedented move, the country opened its rocket launch site to foreign reporters in recent days, offering a glimpse of the reclusive nation's technological progress and space program facilities. Whether that means the launch time of Unha-3 would be announced in advance or publicly televised, however, remained to be seen.